The Vancouver Condo Buzz » UNIQUE PROJECT! 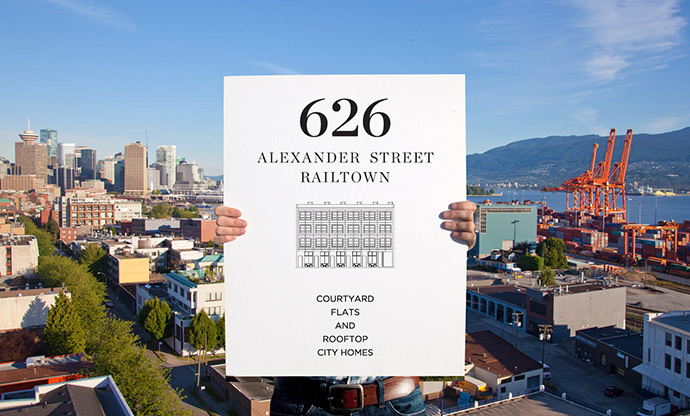 626 Alexander Railtown Courtyard Flats & City Homes in Downtown Vancouver’s Railtown Real Estate District > Only 24 Homes Available! UNIQUE PROJECT! 626 Alexander Railtown Courtyard Flats & City Homes in Downtown Vancouver’s Railtown Real Estate District > Only 24 Homes Available! The PERFECT description for the new Railtown Vancouver downtown condo project at 626 Alexander Street Vancouver is “industrial meets urban.” This is definitely true of the most exciting downtown Vancouver condo development this year! We love changing neighbourhoods and here at the new Vancouver Railtown condo project, rich history marries modern living. Railtown Vancouver has emerged as one of the most forward thinking neighbourhoods. The area was once an industry hub for the city and now, 626 Alexander Vancouver condo project will be thoughtfully designed in a way that not only preserves this history and character, but also offers affordable and modern living experiences for those who like this distinctive community. 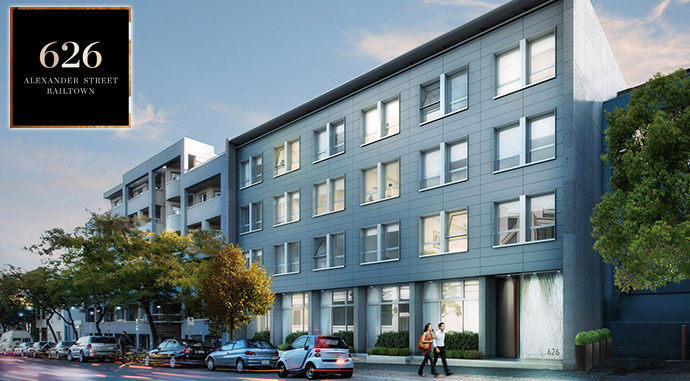 From great design to quality construction, live in one of Vancouver’s oldest districts. 626 Alexander Vancouver condos are magnificent in design and architecture. Gair Williamson architects designed the residential building to feature details, high ceiling heights, and large windows. 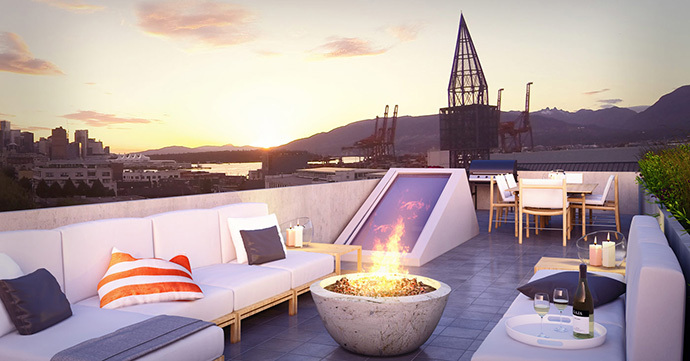 As well, some of the homes at the new Vancouver Railtown condos will have superb private roof terraces with views, making them highly sought after and truly one-of-a-kind residences. Railtown is fast becoming the place to be. Next to Downtown Vancouver’s core as well as Gastown and Crosstown, Railtown definitely has its own character and feel that is both raw yet refined. Rebranded as Railtown from its original name of Japantown or Little Tokyo, this promising neighbourhood is already home to some of the trendiest designers, retailers, furniture stores and micro breweries in town. Occupy Design are the interior designers for this project. If you are looking for more information online, please visit their project web site located at: http://626alexander1-px.rtrk.ca/. The 626 Alexander Railtown condo project is brought to you through a collaboration of professionals that are dedicated to creating this unique living experience for you. Situated in one of the oldest neighbourhoods in Vancouver 626 Alexander Railtown condos are brought to you by Epix Developments and The Circadian Group. GWA or Gair Williamson Architects and Occupy Design round out the project team. There are only 24 courtyard flats and city home residences in this 4 storey boutique low-rise project. Beautiful interior finishes are presented by Occupy Design. Some of these impressive features include solid surface quartz counters that are modern and healthy. They are paired with quartz and porcelain tiled backsplashes in the gourmet kitchens. Other fabulous interior finishes at the new 626 Alexander Railtown Vancouver city homes and courtyard flats include sophisticated and flawless white flat paneled cabinetry with soft close hardware. The homes will also have a range of specialty high-end appliances that includes a Fulgor Milano Italian made built in gas range and wall oven in addition to a Blomberg twenty four inch integrated panel ready dish washer. There’s also the Panasonic built in microwave with a Euro Trim Kit panel. The kitchens at the Railtown 626 Alexander Street Vancouver condo project will feature a Blomberg integrated panel ready fridge with a bottom mount freezer in addition to stainless steel, single basin sink with black Master Chef faucet. 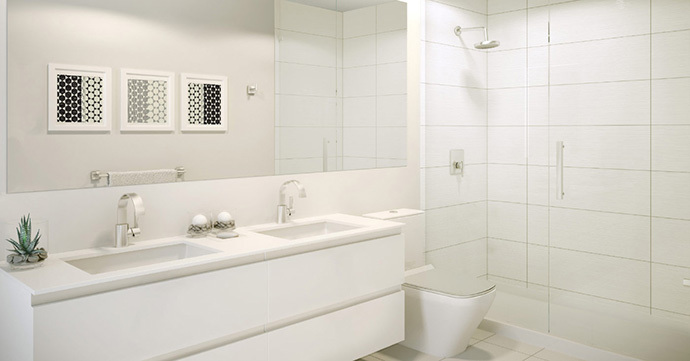 The beautiful bathrooms at the new Vancouver Railtown condos at 626 Alexander Courtyard Flats and City Homes includes porcelain tiled surrounds (in the courtyard flats) and ensuite shower with porcelain tiled surrounds and frameless glass enclosures (in the city homes). Relaxing tubs, European fixtures and environmentally sensitive materials and finishes make these bathrooms and kitchens one-of-a-kind. The one bedroom + flex courtyard flats at 626 Alexander Railtown are a true testament to urban living with well-appointed interior elements and a satiating taste of common outdoor space displayed in a courtyard fashion. The 626 Alexander Vancouver courtyard flats translate into large residences without sacrificing quality and intelligent design principles. The 565 square foot courtyard flats are spacious yet intimate, subtle yet detailed. These beautifully crafted homes favour efficient layouts and create a continuous transition between the living and courtyard areas, brining light and air into the suite. Some of the highlights include integrated European appliance collection, extra work or storage space, bright master bedroom, enhanced hardwood flooring finished in matte oak and built in kitchen island for entertaining. As well, the new Vancouver 626 Alexander Railtown courtyard flats will feature solid quartz countertop and undermount washbasin in addition to a front load washer and dryer and nine foot over height ceilings. The two bedroom + flex city home residences feature an expansive rooftop terrace, a rare find in this advancing neighbourhood. Live large in these unique 1,120 square foot city homes. Glimpse the Railtown corridor, Vancouver city lights, Burrard Inlet, and North Shore mountains from the sanctuary of a seemingly endless rooftop patio. Interior finishings illustrate quality workmanship and savvy design. Embrace three abundant levels filled with light and inspiring architectural form. The boutique Vancouver 626 Alexander Railtown city homes will feature architectural windows with white roller shades and well planned kitchen with room for dining. The City Homes at 626 Alexander Vancouver Railtown condos will also feature extra work or storage space in-suite, a convenient powder room and nine foot high over height ceilings on ALL floors! The top deck is amazing and will include rooftop lounging and dining areas, an operable skylight and roof hatch in addition to vista views! 626 Alexander Vancouver is definitely one of the most unique projects in 2014. We love the look of the architecture, finishes and features. 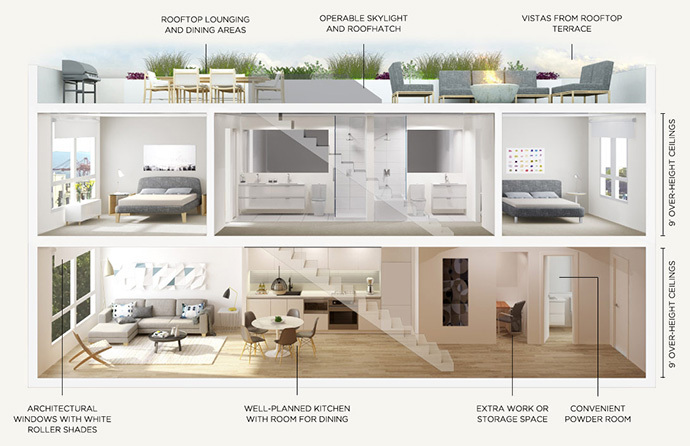 The City Homes are spectacular and will provide multi-level living space and spectacular views from the roof terrace. 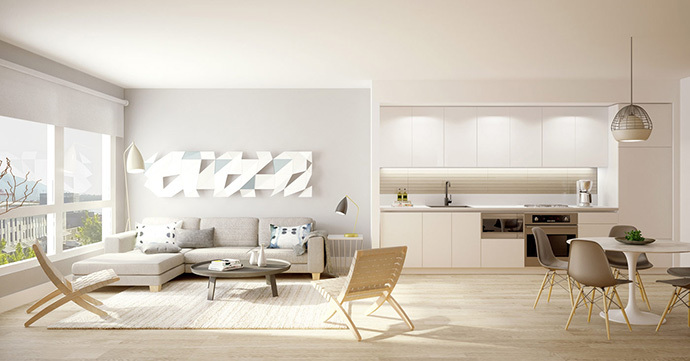 The Courtyard Flats will provide functional living spaces that are compact and beautifully designed and finished.